HiCap is throwing a pre-Halloween bash at the Airplay Cafe in Portland (701 E. Burnside) on Friday, October 30th, 2009. Isopod, Lectronin, and Radio Way will be joined by new friends and Portland transplants, The Pragmatic. It’s going to be a bass-thumpin, heart-pumping 80’s style dance party, and a great excuse to spend a second night in that sweet costume you picked out for Halloween. The show starts at 7:00 PM with a $5 cover charge at the door. 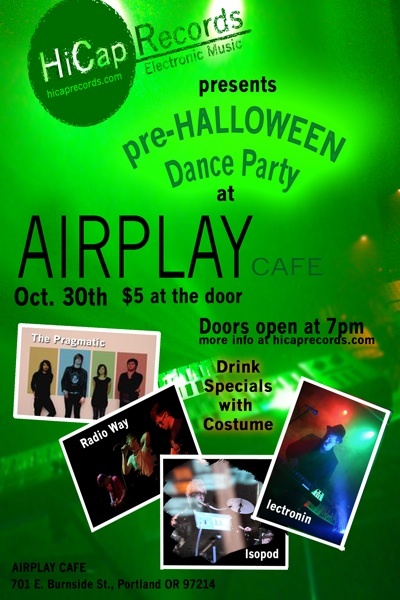 The Airplay is offering drink specials with costume. It’s a great all-ages venue that even has an offering of adult beverages. You don’t want to miss this one!